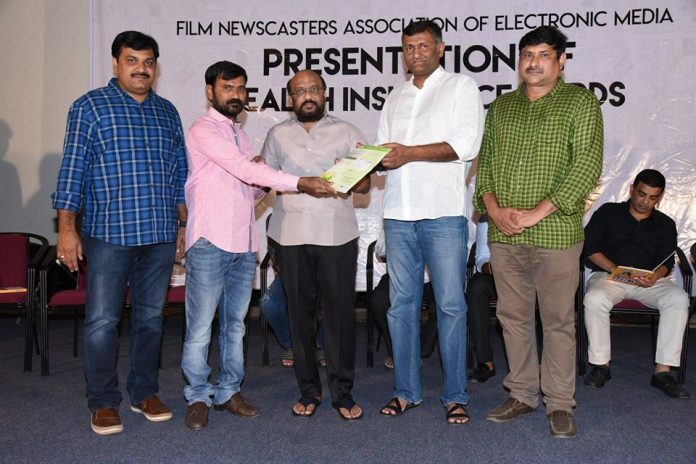 The members of the ‘Film Newscasters Association of Electronic Media’ were on Monday evening issued health cards and association ID cards at a grand event held in Hyderabad’s Prasad Labs. Press Academy Chairman Allam Narayana unveiled the Association’s diary. Prominent director and ‘Matala Mantrikudu’ Trivikram Srinivas unveiled the members’ ID cards, while Naveen Erneni of Mythri Movie Makers and Suryadevara Radhakrishna (Chinababu) of Haarika & Hassine Creations unveiled the Term Policy. Sai Dharam Tej unveiled the Accidental Policy, while the Medical Policy was released by ace producer Dil Raju of Sri Venkateswara Creations. The new office was introduced by Raghu Prasadam, who had worked as the Association’s President in the past.The Association’s members will get the following benefits from the Aditya Birla Family Health Insurance: Medical coverage of Rs 3 lakh for the members and their families, accidental insurance of Rs 25 lakh for members, and SBI term policy of Rs 15 lakh.